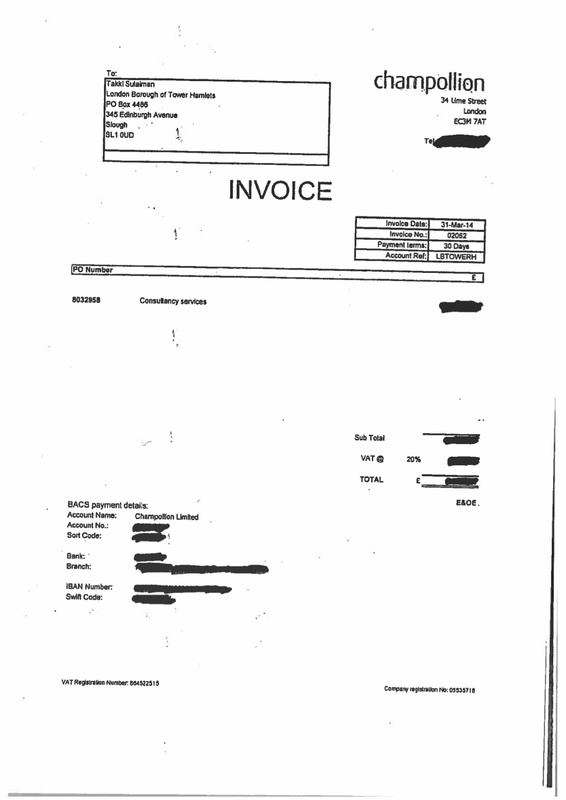 Remember these invoices I was sent by Tower Hamlets council under the Freedom of Information Act? They were submitted by Champollion, the PR specialists hired by the council’s £100,000 a year head of communications, Takki Sulaiman. They were brought in because he and colleagues felt they were incapable of producing a media strategy to deal with the Panorama programme in March. They needed help. 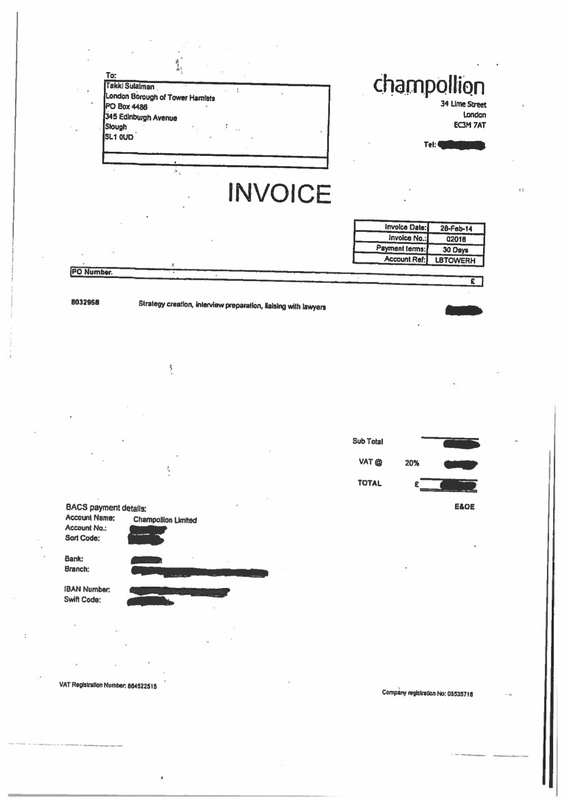 The invoice totals were redacted because the council felt it had to protect its own and Champollion’s commercial interests. Well, thanks to the wonderful Audit Commission Act, which allows people to investigate how their taxes are spent, I’ve been able to obtain the non-redacted copies. So £26,970 + £14,174 = £41,144. 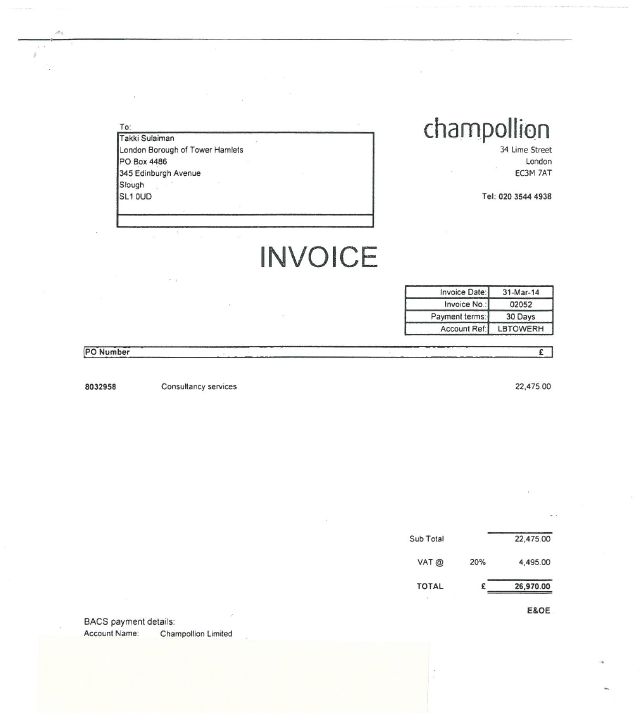 Actually, there was a third invoice from Champollion but because that was submitted after the financial year end on April 30, it falls outside the scope of the Audit Commission Act. We’ll have to wait until next year for that. Still, not bad for a few weeks’ work. I’ve also obtained the contract between Champollion and the council. The contract commenced on February 14 and was signed by Kim Catcheside, a Champollion director and formerly the well-known BBC education and social affairs correspondent. 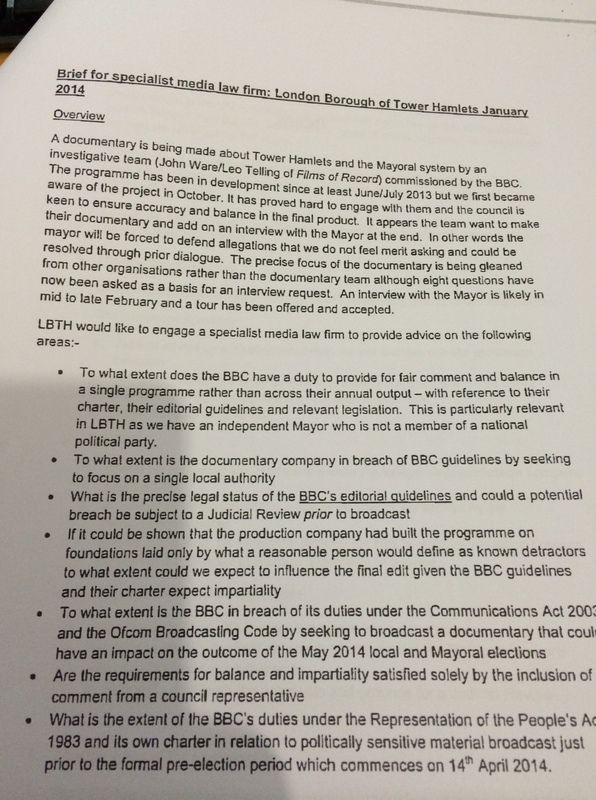 A documentary is being made about Tower Hamlets and the Mayoral system by an investigative team commissioned by the BBC. The programme has been in development since at least June/July 2013 but we first became aware of the project in October. It has proved hard to engage with them and the council is keen to ensure accuracy and balance in the final product. It appears the team want to make their documentary and add on an interview with the Mayor at the end. The precise focus of the documentary is being gleaned from other organisations rather than the documentary team. An interview is likely in mid to late February and a tour has been offered and accepted. 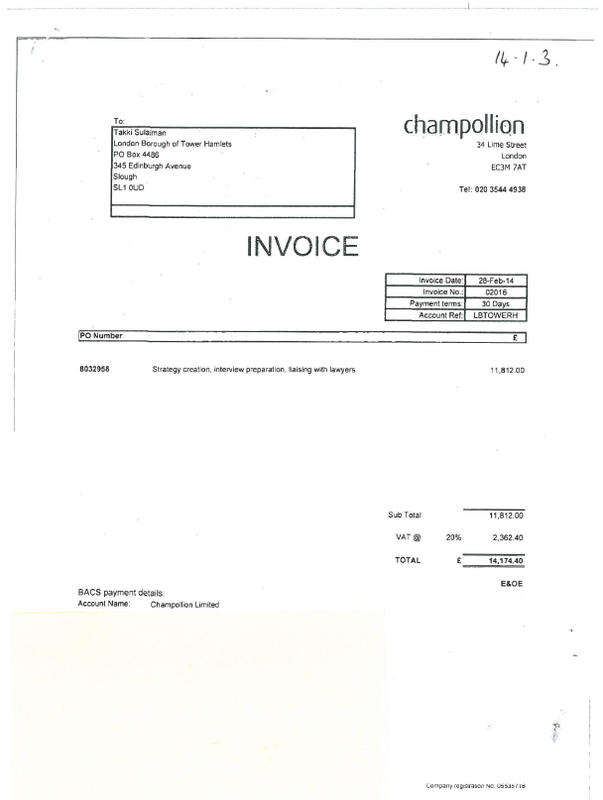 At the back of the contract is a schedule of Champollion’s proposed fees. 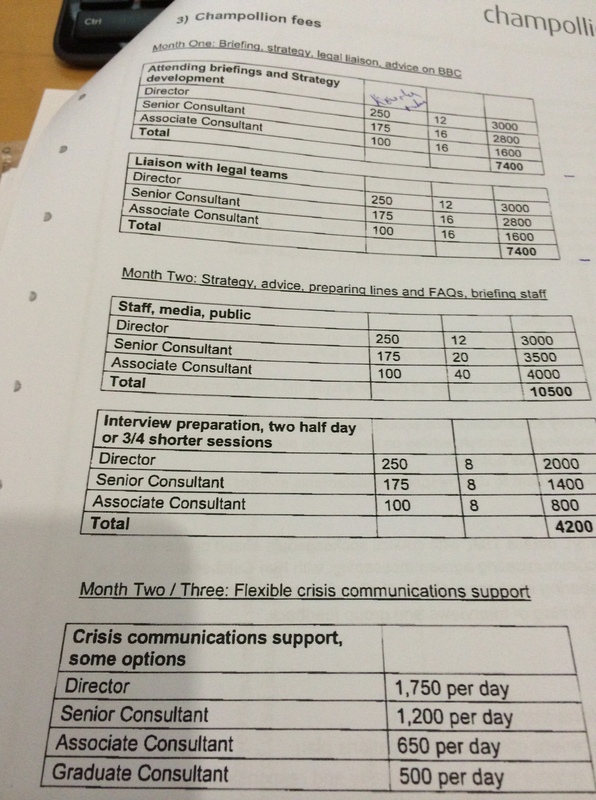 My new documents show that part of Kim’s £250-an-hour work was to spend some time coaching and preparing Mayor Lutfur Rahman for his interview with Panorama’s John Ware. And how very kind of them, you’ll notice, to offer a “Champollion graduate” to the Tower Hamlets press office…at the rate of £500 a day. £500 a day equates to a fee of £135,000 a year. They must have some pretty talented graduates on their books. Maybe Takki should sign up for a job there, if he has a degree. You’ll also see that part of Champollion’s brief was to attend meetings with the council’s legal team. Well, that team, headed by Meic Sullivan-Gould, had also decided it didn’t have the expertise to handle Panorama and ensure what the BBC is required to do anyway, ie adhere to its own charter. So Meic commissioned City lawyers Taylor Wessing. 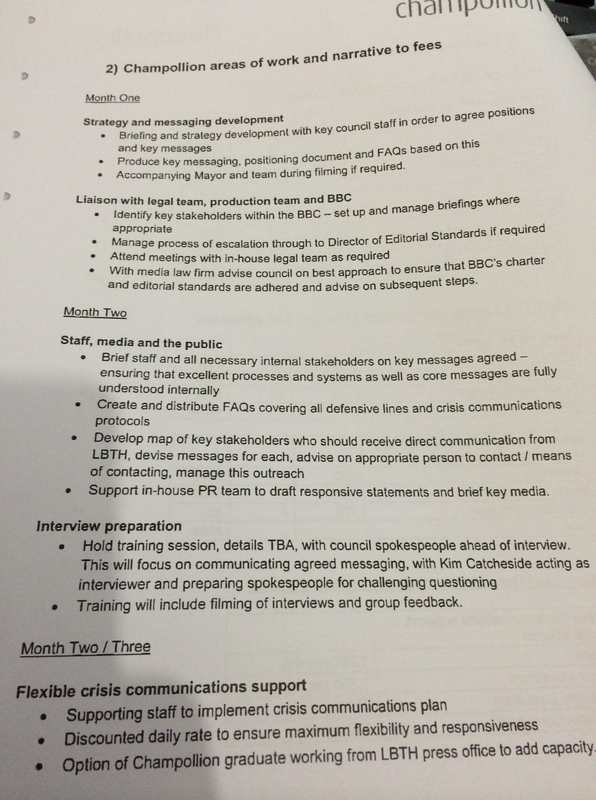 Their brief also included handling the so-called Panorama “whistleblower”, who is now under criminal investigation by the Information Commissioner’s Office. They also spent many hours examining the dossier she “obtained” from Panorama and which she passed to the mayor’s office in (probably) late January. Thanks to the Audit Commission Act, I’ve also obtained the invoices from Taylor Wessing, its contract with LBTH and various other incredibly interesting back-up details. So that’s £36,922.72 + £40,170.74 + £3,179.72 + £1,651.52 = £81,924.70. 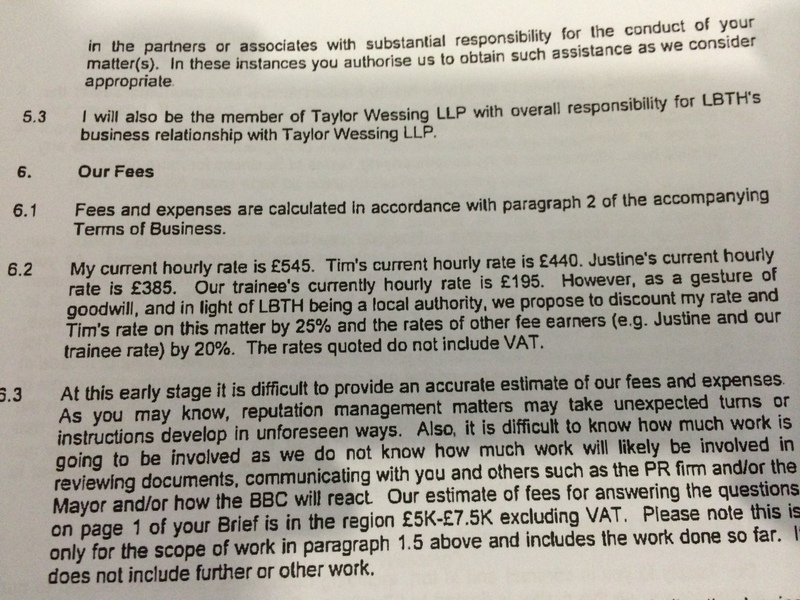 But Taylor Wessing were ever so kind when it came to costs. Here’s a section from a letter sent by their Trademarks, Copyright and Media Partner, Niri Shanmuganathan, to Meic. So the partner charged £408.76 an hour; Tim Pinto, the “trademarks copyright and media senior counsel” charged £330 per hour; and the trainee was charged at a mere £156 per hour. All plus VAT. They even charged LBTH for reading my blog! Which is free. At least someone’s making money from it. I write all this, and there’s more to come, because any Tower Hamlets elector has the right to object to the council’s accounts. You have the right to dispute these invoices if you feel they are not valid or properly commissioned in some way. In summary, the council paid at least £123,068 to Champollion and Taylor Wessing to try and stop/limit the damage from a half-hour Panorama documentary. The council’s Audit Committee meets on September 16 when the external auditors will meet officers and councillors to discuss the draft accounts. Any objection should be raised then. I’ll dig out the email and post it here tomorrow. Meanwhile, the wait for the PwC report into LBTH continues (at a cost of £1million…). Sometimes you just have to despair. 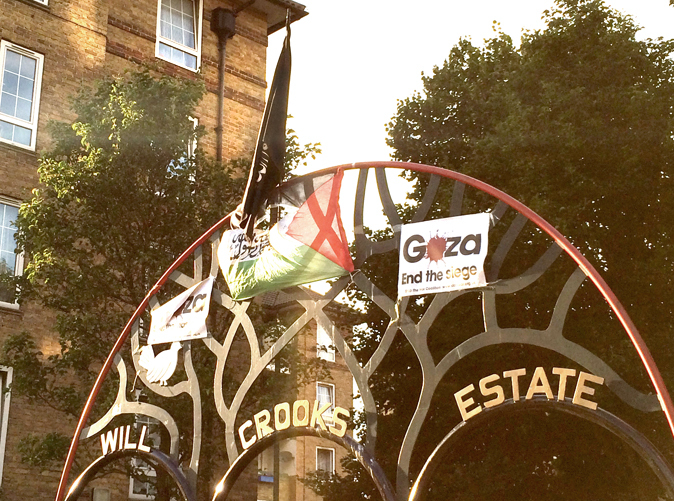 I was told this morning the black shahada flag that was taken down from the gates to the Will Crooks estate in Poplar on Friday morning is now back up. I’m told this followed an angry estate meeting on Friday when wiser heads warned that re-erecting it would be provocative and bound to cause trouble. I’m told ex-Respect councillor Dulal Uddin, who appeared on a strange Newsnight account of the affair on Friday (when there was no mention of the anti-Semitic abuse directed at me and Guardian journalists the previous evening), was the key agitator behind its return. Dulal was one of the more unremarkable councillors during his stint from 2006-2010, but I’m told he’s desperate to get back into the council. There are some who believe he’s using this row for his own ends. I understand that Sister Christine Frost, the community activist who asked for the flag to be taken down, is furious her actions were reported as “Christian nun tears down flag”; her actions were not faith-related but potential trouble related. I understand she disagrees with it being back up. I understand she’s concerned the issue is being exploited by politically motivated adults who don’t even live on the estate. Whatever the motives, this is a stupid and dangerous move. re-erect the Shahada, but with explanations in English below for ‘non-Muslims’. It would say it’s a flag that affirms the Islamic faith. Some quick thoughts (I have a lunch date I need to make). 1. If they want a flag, why not settle for the Palestinian flag? Flying an Islamic flag (that experts say on a black background has jihadist overtones) sends the message this is a religious conflict. 2. This is a Tower Hamlets Homes estate. It is publicly owned. The council has ultimate control and ownership. Why is THH allowing political/religious flags to be flown from public property where people of all faiths and none live? How does that square with inclusiveness? 3. Mayor Lutfur Rahman asked for the flag to be taken down on Thursday night. Surely, he’ll have to follow that through. 4. 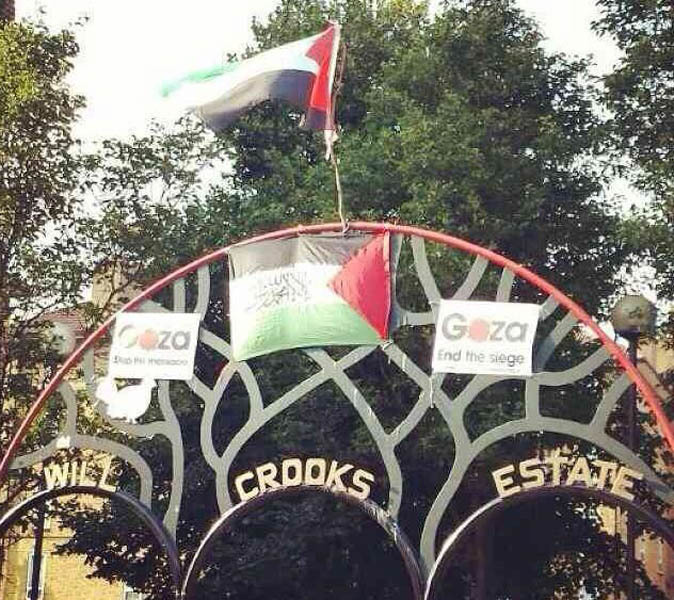 I’ve not heard one apology from any of the leaders of the Will Crooks estate for the anti-Semitism. It’s not even mentioned in a statement I know they’ve distributed to people. 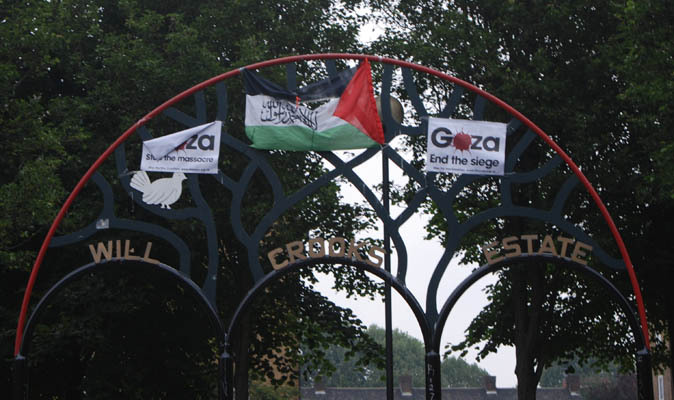 The agreement of Friday’s estate meeting was, according to someone there, to re-erect the flag somewhere in the estate so long as it was accompanied by a translation of the shahada. That meeting agreed to meet again tomorrow to decide when and where it would go up. However, last night someone broke that agreement. Key figures on the estate believe Dulal Uddin and others were agitating for it to go up again before tomorrow’s meeting. I’m told that Sister Christine Frost rang the police this morning to tell them the flag was back up. That’s why, as Cllr Andrew Wood reported in the comments section of this blog, Ch Insp Anderson was there today. In fact it was Ch Insp Anderson who supervised the removal of the flag again this afternoon. Sister Christine has asked Lutfur to ensure that no religious flags are allowed in public places such as that estate. She wants to foster inclusiveness there. In the meantime, and before Lutfur was aware of Jim’s intervention, the mayor had ordered it again to be removed. He has also asked the council’s youth service to conduct some “serious engagement” work on the estate to ensure the youth (and probably some adults) fully understand the issues. I’m also told the estate caretakers have been told to look out for flags on their morning rounds, and remove any that have been hoisted again.